When selecting compensation projects for our CO2 emissions, we require them to have tangible social benefits. 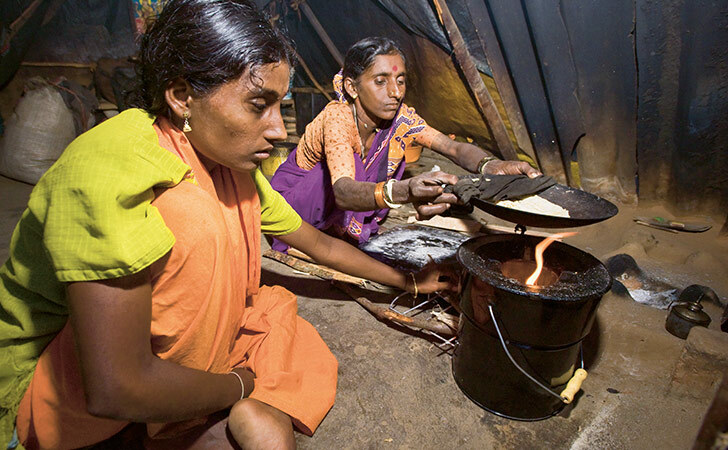 In 2016, we chose a “Gold Standard” (www.goldstandard.org) project that provides clean cooking stoves for poor communities in the southern Indian states of Tamil Nadhu and Karnataka. In India as a whole, over 60% of the population uses firewood for cooking, and for approximately 170 million families it is the main source of fuel. The traditional way of cooking over an open flame with wood exposes family members inside the home to a high concentration of toxic fumes, which causes a range of respiratory problems and is estimated to contribute to approximately 500 000 premature deaths per year. Moreover, the reliance on firewood has led to widespread and accelerating deforestation. Village dwellers in India using an efficient cooking stove that reduces smoke and toxic emissions, cuts firewood consumption and saves time. Purchase of the stoves was subsidised through a carbon offsetting scheme from which we bought our Voluntary Emissions Reductions for 2016. The project, which is managed by our partners South Pole Group (www.thesouthpolegroup.com), comprises the design, manufacture and distribution of efficient household cooking stoves for 200 000 rural households. These stoves reduce smoke and toxic emissions by 80%, significantly improving the health and wellbeing of the families that use them. Besides requiring less fuel, the stoves also cook much faster. This means the families can save time and money and turn to more productive activities, especially children’s education. Normally, people in Tamil Nadhu and Karnataka spend about three hours per day collecting firewood. An added feature of the project is that it trains local women as entrepreneurs and actively involves them in the marketing and sales of the stoves. This enables them to earn their own income and to improve their social position in their rural communities. In total, the project prevents the emission of around 27 500 tonnes of greenhouse gases. The money generated through the associated certificates is used to subsidise the cost of the cooking stoves, making them more affordable to the local families.